Today they forecast an early shower but that failed to deliver, they forecast a top of 23C but it was warmer but there was a decent breeze (headwind at some points). I did the usual struggle out of bed and get myself sorted, didn’t want to be late today as was meeting CasualCyclist to take him for his first SPR ride and he was meeting me at my place. Durx was to join us but wussed out after an apparent late night, so he would meet us at the usual start point. CasualCyclist arrived and after topping up the air in his tyres we headed off. The ride was fairly routine, but did notice a lot more people out than usual at that time of day. Maybe the warmer weather is bringing them out of hybernation. Also there was a fair amount of activity about with the Burswood open air Cinema in construction and the Camping & 4wd show on the foreshore. We arrived before time and found Durx already there chatting to Lorraine. Madrapper was late as usual but with a 20km warmup u can’t blame him. He got in just in time for the pre-ride briefing. The route was explained and Global_Bean got a ribbing for his Movember efforts 🙂 The turnout was pretty good with 50-60 riders along for the trip. The pace was steady on the head out and I kept 2nd wheel for most of the way to the split. 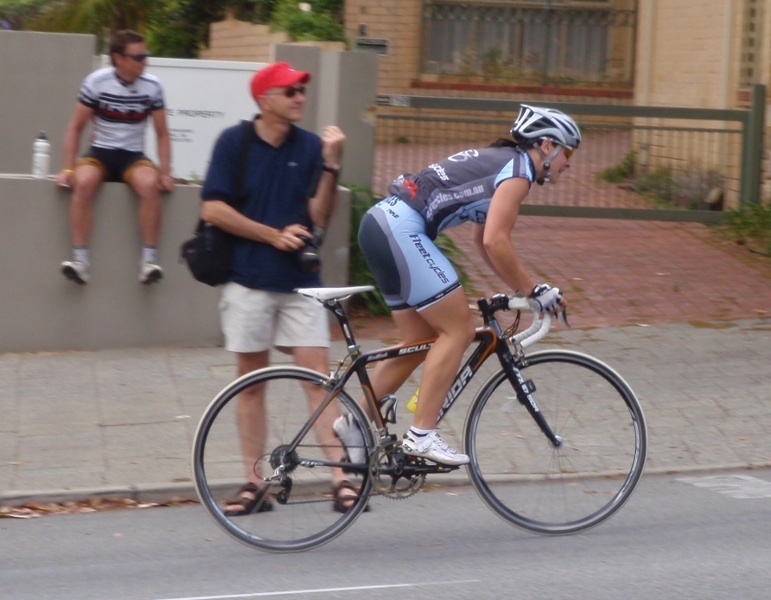 After the split the pace picked up a bit on I was hanging off the back a bit on the long gentle uphill to Midland Rd. Along this stretch CasualCyclist got dropped, more used to the slower pace of an AUDAX ride he struggled with the pace the front runners were setting. A few more rides with the SPR crew and he’ll be up to speed. After the turn onto Midland road Kim(thanks for the leadout) dropped back to help get me back in touch with the group, along the way we picked up a few other stragglers including Madrapper who was yo-yoing off the back also. We caught up just as the group hit some road works, so there was a chance to recover from the extra effort. From here I kept the wheel and avoided being caught snoozing til Guildford Rd. I continued to hold on for the 1st half of Guildford Rd but was bouncing of the back a bit, just staying in touch thanks to a few red lights. Once the rolling hills hit though I was off the back for good and just couldn’t seem to bridge the gap. I kept the group in site til just before East Parade where I caught a red and lost them. 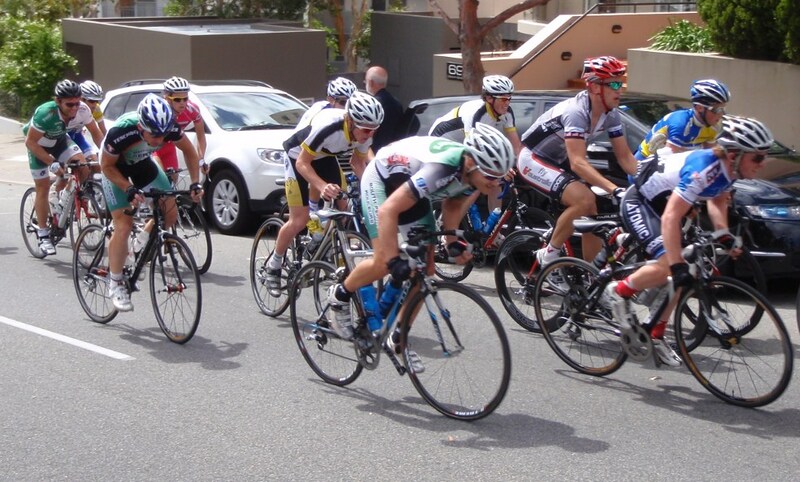 With not far left to go I continued on at a steady pace picking up another rider who also got dropped. 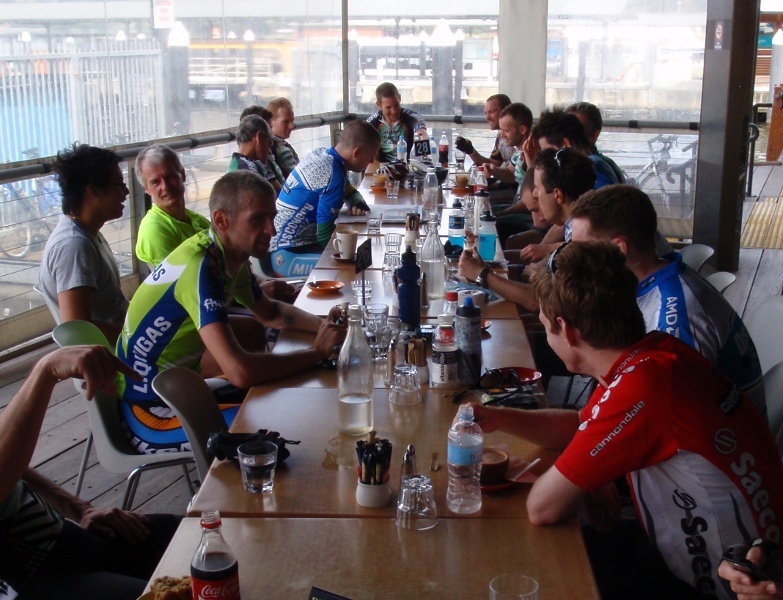 We continued on to post ride coffee and arrived only a few minutes after the rest of the group. I thanked Kim for the assistance and a few of the lads commented on my improvment since starting with SPR. I may soon keep with the group for the whole trip. Post coffee a few of us headed up to Kings Park to watch Stage 1 of the Tour de Perth, where a few of the SPR crew where taking part. It was good to have a club presence and get the club colours out for show. We stationed ourselves on the climb just before the finish line, where we hoped most of the action would take place. The Womens race was pretty much in the bag about half way thru with Queensland’s Ruth Corsett dominating the race, and the group finish was a sprint for the remaining places. The mens on the otherhand came down to the line. Graeme Brown was in front coming up the climb but it hink went too early on the sprint as he couldn’t hang on and ended up 4th, getting pipped by Richard Lang. 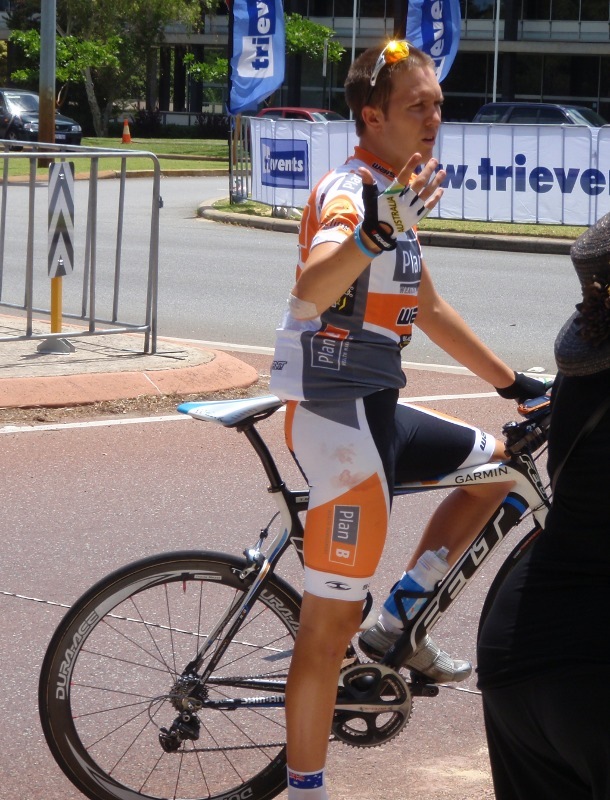 Perth’s own Travis Meyer held on for 2nd place which was enough to secure him the Green leaders jersey at the end of the day. This entry was posted on 14 November, 2009 by Fairy. It was filed under Road Cycling, Twitter Clowns and was tagged with Cycling, headwind, humid, pain, perth, SPR, Tour de Perth. Looking back at my ride log I realise that before this morning I had only put in 40km in the last month! Probably explains my lack of legs. I enjoyed it though. 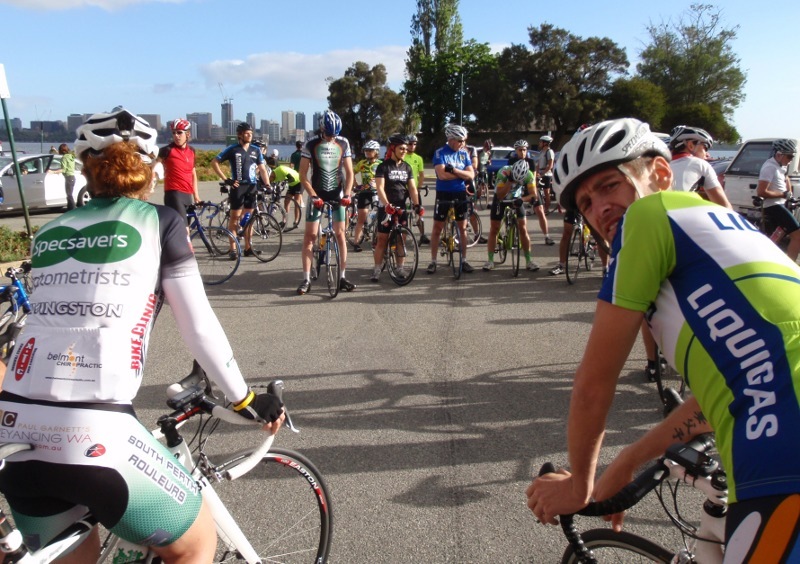 SPR is a friendly, well organised group and I like the way they run their rides. Will definitely ride again. Good blog man! Very enjoyable read and nice video too. Well done. Of course now that you have dissed my mo I expect a donation from you too!